We’re digging into how to move from pushing to receiving. Jillian Bolanz is a Life and Business Coach, writer, speaker, and facilitator. She is the host of True You Live- an inspirational, self-discovery, in-person event as well as the host of the Morning Sunshine with Jillian Bolanz podcast and the self-published author of “True You: A Self-Discovery Journal for the Curious Heart”. 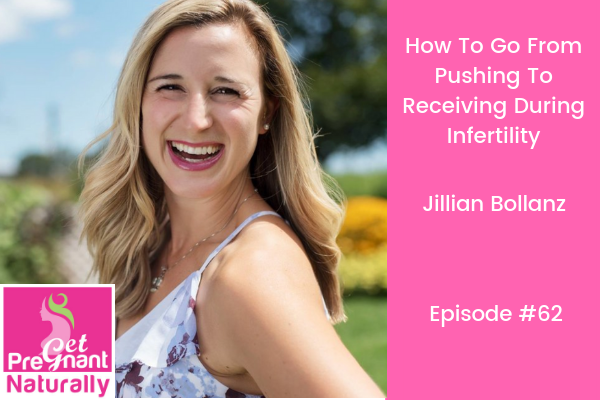 The founder of multiple coaching programs and the leader of many in-person retreats and experiences, Jillian helps motivated women loosen their grip on force and control, lean into trust, and create the lives and businesses they truly want. She’s helped women across America through this self-discovery and life/business building journey all while being home and present for her husband, her two sons, and her own true self. It ALL starts with belief…because when you believe it will happen…deep in your soul…you do the necessary work. The women I work with are action takers. They do the functional testing (food sensitivity, hormone and stool testing). They take the targeted supplement protocol. They dial in their sleep, throw out the toxins, and filter their water. They lean into the feminine…moving from pushing to receiving…opening up the space for their baby. Tapping into that inner knowing…that place where they just know they will be a mother. Are they scared, frustrated, sad, angry? Yes! Helping them see patterns…and allowing them to make subtle, yet powerful shifts. Because with functional medicine ALL the changes matter (not all at once…small steps over time). 2) The difference between masculine and feminine energy and why it matters when you are #ttc (hint – pushing versus receiving). 3) Are we really made for struggle? As Christiane Northrup says “our beliefs are more potent that our genes”. Plus strategies to get unstuck…to become less rigid and more fluid. 4) What to do when we feel depleted or hardened (yep! that means we’ve got too much masculine energy). Book your free Supercharge Your Fertility Discovery call. We’ll come up with a simple plan to help you move forward…towards your dream of having your baby.